Allen Ginsberg (1926-1997) is cherished as the pivotal figure between the 50s Beat Generation and the counter-cultural revolution of the 1960s. He was born in Newark, New Jersey the son of a high school teacher and poet, Louis Ginsberg, and Naomi Levy Ginsberg. His early experience included dissent: his mother was a member of the Communist Party and sometimes took her sons along to the local meetings. Her periods of mental illness disturbed Ginsberg greatly, resurfacing in his great elegy to her, 'Kaddish' named after the Jewish prayer of mourning. Ginsberg studied at Columbia University where he made crucial friendships with writers such as Jack Kerouac and William Burroughs. 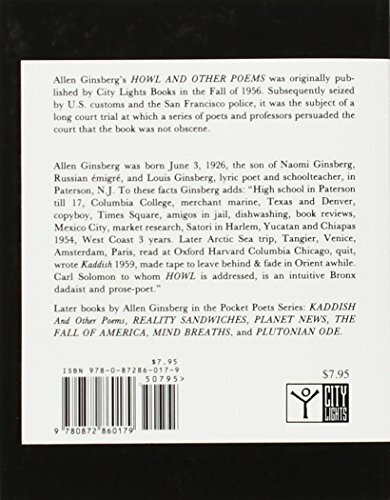 Ginsberg's first book of poems, the extraordinary Howl and other poems was published by Lawrence Ferlinghetti's City Lights press in 1955 and was subject to a famous obscenity trial due to its frank treatment of his homosexuality and explicit content. The case became a cause célèbre for defenders of freedom of speech, the judgement finally overturned by Judge Clayton Horn on the grounds of the book's "redeeming social importance". Other equally subversive volumes appeared during the next few years, whilst Ginsberg publicly championed such causes as drug liberalisation and sexual freedom and forged links with a new generation of artistic rebels, including Timothy Leary and Bob Dylan. A tireless traveller and unofficial youth ambassador, Ginsberg continued to be a focus for dissent against the juggernaut of consumer capitalism. His 1981 collection Plutonium Ode won the National Book Award and in 1993 he was awarded the medal of Chevalier Des Arts et des Lettres by the French government. Latterly he was a Professor at Brooklyn College and died in New York in 1997. Ginsberg's poetry with its exhilarating openness of subject and form and visionary qualities owes much to a tradition stretching back through Walt Whitman to William Blake. Added to this are influences from his Jewish background, the rhythms of jazz, his sexual orientation and his deep engagement with Zen Buddhism. His public performances were legendary, his friend Herbert Gold described him as "an Olympic-class ranter". We're delighted to be able to present several of Ginsberg's most famous poems in the Archive. The first of these, 'America', is an amazing rendition in front of a live audience recorded in 1956 - Ginsberg's irrepressible humour delight his audience even as his poem enumerates reasons to despair with contemporary American culture. The same target is evident in 'A Supermarket in California' with its garish neon light and piles of consumer goods. In this unlikely setting Ginsberg encounters Garcia Lorca and Walt Whitman, making explicit the poetic mantle he wished to inherit. This studio recording is clear and more meditative in quality. Finally, in its 50th anniversary year, you can listen to Part II of 'Howl'. Here the mood darkens, 'America' has become 'Moloch' the name of the Canaanite god to whom child sacrifice was made. The humour has gone, replaced by a prophet-like anger and anguish. 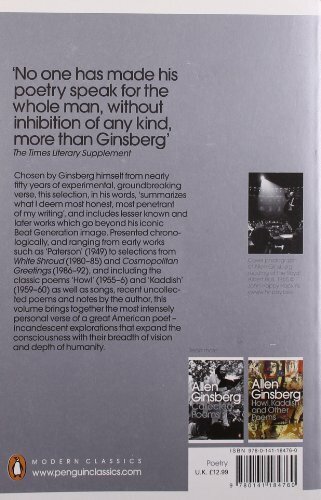 Although the sound quality is quite muffled the recording is unique, made at a public performance only a year after 'Howl' was published and capturing Ginsberg's electrifying effect on an audience. The recording of 'A Supermarket in California' was made in 1956 at the Pacifica Studios, Berkeley, California. 'America' was also recorded in 1956, whilst the recording of 'Howl: Part 2' is from the private collection of Ginsberg and Harry Redl and was made at Town Hall Theatre, Berkeley, California. At a reading in honor of The Poem That Changed America: 'Howl' Fifty Years Later, protesters from the Underground Literary Alliance make a scene.